WASHINGTON -- The number of Americans filing new claims for jobless benefits fell to a 14-year low last week and industrial output rose sharply in September, positive signals that could help ease fears over the economic outlook. Initial claims for state unemployment benefits dropped 23,000 to 264,000, the lowest level since 2000, the Labor Department said Thursday. A separate report from the Federal Reserve showed production at the nation's factories, mines and utilities advanced a larger-than-expected 1 percent last month, the biggest gain since November 2012. The data offered evidence the economy remained on solid ground, with the labor market gaining steam. Investors in recent days have come to the view that slowing growth overseas will weigh on the U.S. economy and force the Fed to delay a hike in interest rates. Weak retail sales data Wednesday shook investor confidence and helped fuel a global sell-off in stock markets that continued Thursday. U.S. stock markets were trading sharply lower. The jobless claims report nonetheless reinforced expectations that slack in the labor market was being reduced. "Have we achieved full employment? Not yet. Are we getting closer? Absolutely," said Stephen Stanley, an economist at Amherst Pierpont Securities. It's possible some of last week's drop in claims was related to America's Columbus Day holiday, which may have affected how the Labor Department adjusts the data for seasonal swings, economists at RBS said in a note to clients. The government, however, said there were no unusual factors in the report, while the four-week moving average of claims, which irons out week-to-week volatility, also fell to its lowest level since 2000. A Reuters poll published Thursday showed economists still clinging to the view that the Fed would raise benchmark borrowing costs from near zero in the second quarter of next year despite mounting signs of weakness overseas. The poll, however, was largely complete before the latest stock market sell-off, which has been accompanied by a big shift in investor expectations for the path of U.S. monetary policy. Interest rates futures are now pointing to a rate hike in October 2015. St. Louis Federal Reserve Bank President James Bullarad said in a television interview with Bloomberg that the U.S. central bank might want to keep its bond-buying program running for longer than anticipated given a drop in inflation expectations. For now, at least, the U.S. economy is motoring ahead, with economists still expecting third-quarter growth to come in at around a 3 percent annual rate, a view buttressed by the pickup in industrial output. The Fed pinned part of the gain to unusual weather that boosted air conditioning use, but there was also a broad-based increase in factory output, which grew a solid 0.5 percent. 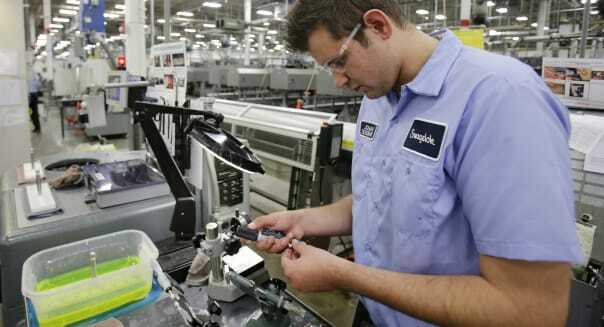 A third report from the Fed's Philadelphia branch showed slowing growth in factory activity in the mid-Atlantic region.